We Service the Front Range and More! We had a phenomenal experience with Solar Side Up. We worked with Michael DeRosia and the entire process was incredibly smooth and efficient. Everything from the initial meeting and quick house review to getting detailed designs of the recommended panel setup. Once we were ready to move forward they got us scheduled and the team showed up on time for the install and everyone was friendly and professional. The install was completed on schedule and the Xcel Energy meter was completed the very next week! So we were able to turn on our solar very quickly and now we enjoy watching the daily detailed analysis of how much energy we are producing from clean solar energy. 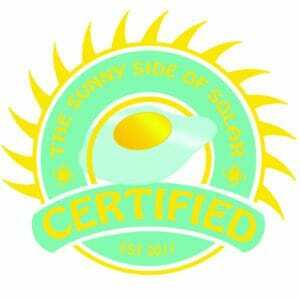 We had such an amazing experience with Michael and Jeff from Solar Side Up, I confidently recommend them to everyone! If you have ever thought about solar talk to these guys! They were VERY thorough and professional. Excellent work, professional & conciderate workers and done on time! LOVE having solar! These guys were fantastic! I was looking at a lease from a large company. It seemed too good to be true and it was. After talking with Jeff at SSU he showed me all of the reasons never to lease a system. I purchased one from SSU. I now pay less every month for my loan payment than my electric bill. I take the difference and pay my loan down every month. All the interest is a write off! Plus I got a 30% tax credit. They totally saved me. Their installation was so clean and quick I could not believe it.